When an item or surface you are using needs to be cleaned and disinfected, use CaviCide. CaviCide is a cleaner and disinfectant that has the ability to kill several types of bacteria, viruses and fungi -- such as salmonella choleraesuis, hepatitis B and C and influenza -- within five minutes. And unlike many other disinfectants, CaviCide is non-toxic, non-corrosive and does not produce any strong odors or fumes. Due to it's ability to clean and disinfect, it's most commonly used in dental, medical and veterinary settings. Although it can be used in most other settings, such as your home and office. The product is safe to use on any non-porous surface. Dampen a soft cloth. 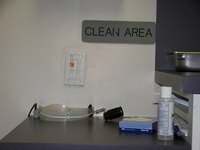 Wipe away all residue, hair, crumbs, or other items that can easily be removed from the surface you are cleaning. Wear rubber gloves. CaviCide is a strong disinfectant which can burn your skin, if it is not properly protected. Hold the bottle of CaviCide approximately three to six inches away from the surface, or item to be cleaned. Spray a liberal amount of CaviCide disinfectant on it. For a complete list of items and surfaces that can be disinfected using CaviCide, navigate to the Complete List of Uses webpage on the CaviCide website: The link is provided for you in Resources, below. Wipe the area clean using a paper towel. Be sure to remove all residue, dirt, dust and buildup. Throw away the dirty paper towels. Spray a liberal amount of CaviCade spray onto the cleaned surface. The entire surface should be wet from the spray. Allow the spray to sit on the surface for five minutes, to ensure it kills and disinfects the entire surface. Wipe the disinfectant from the surface, using a paper towel. Continue until the surface is dry. Discard the paper towels. CaviCide can be used to disinfect non-porous vinyl, stainless steel, painted surfaces, Plexiglas, Formica, as well as glass items and surfaces. Never use CaviCide to disinfect porous surfaces. The disinfectant can seep into the porous surface causing discoloration and water damage. Never mix CaviCide with any other chemicals or cleaning solutions. The chemicals can interact, possibly producing dangerous fumes. Never dilute CaviCide. Diluting it can inhibit it's ability to properly disinfect.